No shuttle service and no pool. 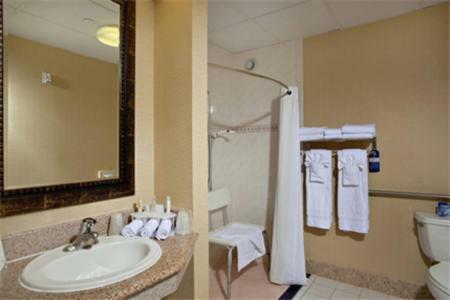 The 70-room Holiday Inn Express San Diego is located off the 15 Freeway in Mira Mesa and provides quality affordable accommodation equally suited to the business traveler or families on vacation. Items included with the room rate at this four-story hotel are a hot breakfast buffet, high-speed Internet access, local telephone calls, a morning newspaper, in-room coffee and parking. There are four meeting rooms available for business or social functions. The largest can accommodate 200 guests. Area landmarks and attractions include SeaWorld, the San Diego Zoo, Mission Beach, Pacific Beach, La Jolla, the Wild Animal Park, Legoland, Balboa Park, Old Town, downtown San Diego, the Harbor and Coronado, the Ice Arena, Qualcomm Stadium and the local casinos. All the rooms have a work desk with high-speed Internet access, television with cable movie and news channels, coffeemaker, iron and ironing board, hairdryer and two dual-line telephones with voicemail. Connecting rooms, rollaway beds and cribs are available. The 24-hour front desk has safe deposit boxes and information on area events and attractions. Other amenities include copy and fax machines available for guest use, daily housekeeping, a guest laundry, same-day dry cleaning service and ice and vending machines. There is a Dennys on the property which is open 24/7 and numerous restaurants close to the hotel. Location, location  this hotel has it in spades. The property is close to both business parks and offices and the attractions that make San Diego a favorite with families. Those who have stayed here say the rates are affordable, even if the amenities are a little limited. There were good reviews about the cheerful crew of employees who handle problems promptly and have good ideas about dining and shopping. Many guests say they will return to this hotel on future visits to San Diego and have no hesitation recommending the property to fellow travelers.